Bukchon Hanok Village rests between the two palaces of the Joseon Dynasty, Gyeongbokgung and Changdeokgung. 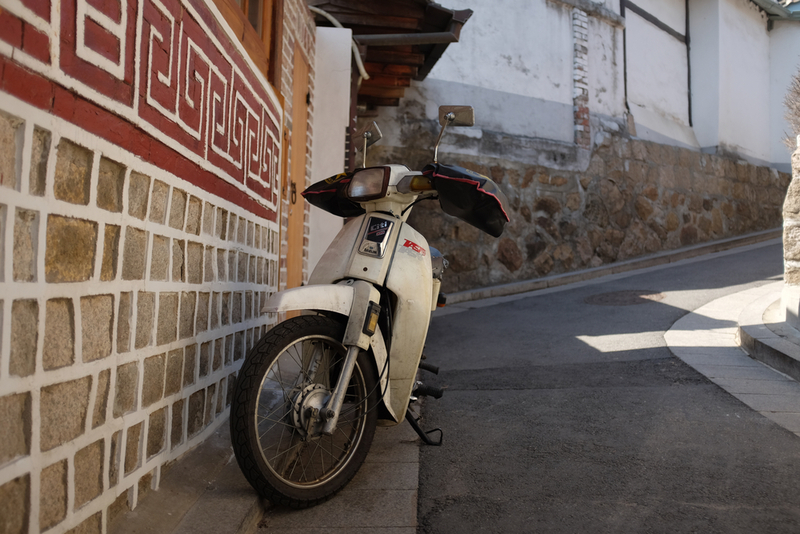 This is one of the few remaining Korean traditional villages with a long history composed of alleys, hanok and is preserved to show a 600-year-old urban environment amidst the backdrop of modern day Seoul . What drew me to Bukchon was that unlike other hanok villages, Bukchon was not created exclusively as a tourist destination but it is a living, thriving area inhabited by residents of Seoul, comprising about 900 hanoks spread across 11 dongs or alleyways. A quick search of the web will tell you that "the reason there are so many traditional houses in this area is that many yangbans (people from the ruling class) lived here during the Joseon Dynasty (1392-1910)." As a residential area, there are signs throughout the neighborhood asking visitors to respect the residents' right to peace and quiet. So as you can imagine, the climate is perfect for thoughtful exploration and contemplation. The neighborhoods that span the village include Gahoe-dong, Songhyeoun-dong and Samcheong-dong and whose names clearly evoke and affection for all Seoulites who live there. What drew me in immediately was the subtle and simple architectural style of the buildings and the interplay between the basic construction elements used to make the hanoks and the visual appeal that draws you in as a result. The location is a maze of steps and alleys leading in and out of intimate corners and backroads as well as gorgeous expansive views of Seoul's contemporary skyline. The subtle and earth friendly architectural elements of stone, clay and wood are combined in such a way that it becomes evident this is a special place where landscape and space are thoughtfully commingled to create a stunning visual experience. Experiencing a town where 600 year old Korean architecture is both preserved and respected gives you an opportunity for reflection and a keen understanding of historic Korean design aesthetic. The symmetry and care taken to interweave the relationship of building materials with an ability to express intimate living surroundings makes it clear why many Seoulites choose to live in this gorgeous oasis. It reminds me of the historic neighborhoods found throughout the northeast where people are finding a desire to move away from templated home dwellings and gravitating towards a sense of craftsmanship and purpose of space. Exploring this area of Seoul is very easy to get to. A short cab ride can take you directly to the drop off area outside the entrance to the village and the Seoul Metro Subway system is one of the easiest and safest public train systems I have had the opportunity to use. Getting there is easy. Spending the day exploring the inside of the village was amplified by the gorgeous spring day we had with sunny, warm temperatures and a cool, soft breeze making its way in and out of the nooks and crannies surrounding Bukchon. I was surprised to see very few Western tourists and yet the area was bustling with visitors from all over the world. As a photo enthusiast, it should be a required stop on your visit to Seoul and while I did not venture far from the main area, there are key destinations including the Gyeongbok Palace, Changdeok Palace and Jongmyo Royal Shrine. Despite being the heart of northern Seoul, Bukchon was a peaceful and relaxing way to spend time taking photographs and enjoying the architectural history of South Korea. 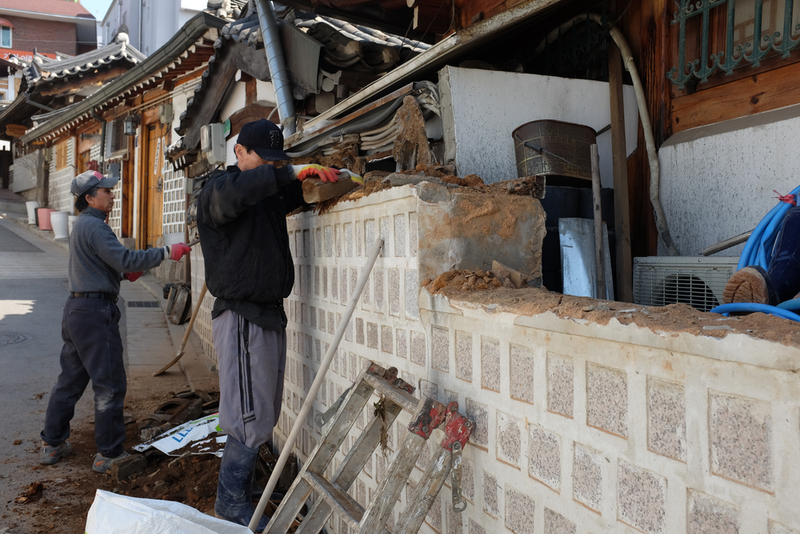 As I made my way through the various alleyways I stumbled upon a pair of workers who were actively working on repairing a portion of one of these beautiful dwellings. Beyond the walls of the hanoks and alleys the main streets sounding Bukchon are filled with small shops, street food vendors and outdoor markets. The desire to enjoy some Korean food and culture are all within walking distance and the shops and areas that surround the historic village give way to new opportunities to explore Seoul at it's finest. 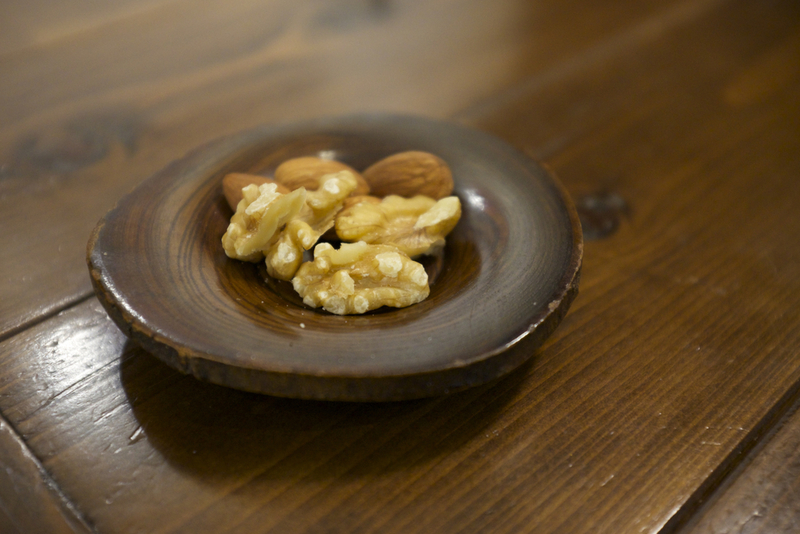 As someone who has had the privilege of enjoying food from a variety of countries around the world, I am particularly at home in Seoul where those who are adventerous enough can pause to enjoy a small taste of local flavor. 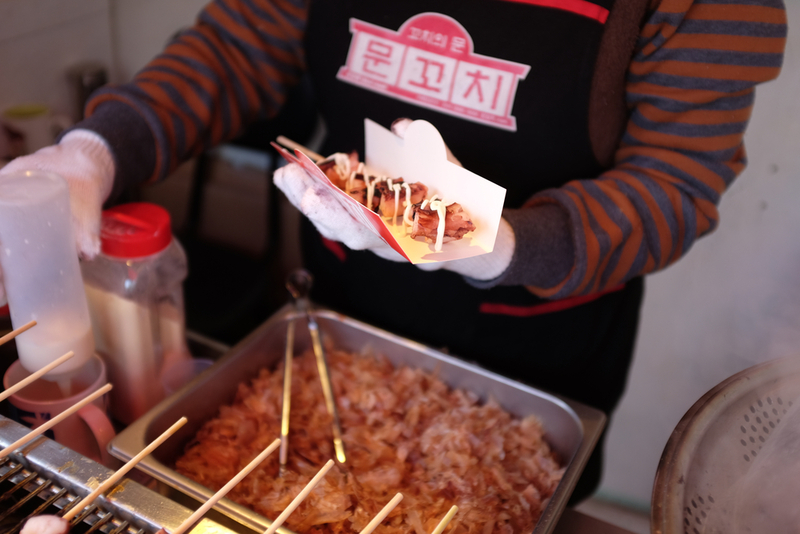 It was clear that the local Seoulites who were visiting that day had congregated near two particular food vendor stands and so the decision to stop and enjoy some grilled octopus with bonito flakes and mayo sauce was an easy one. 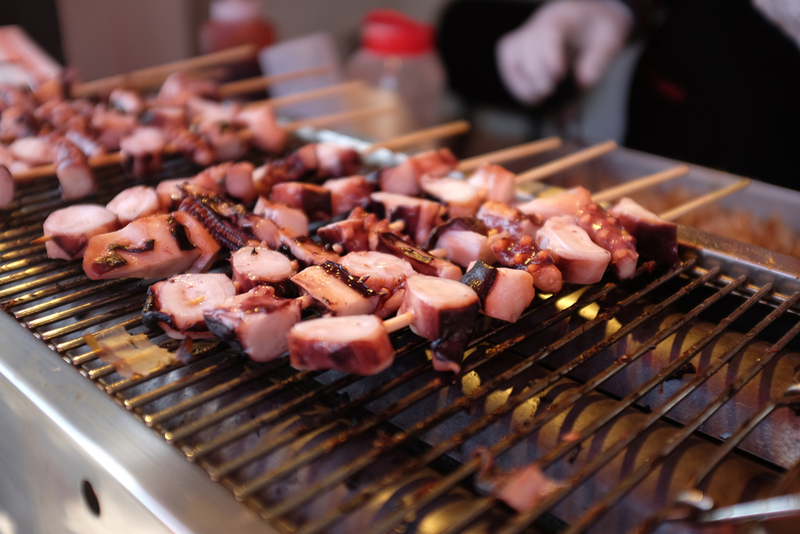 The savory, sweet grilled octopus coupled with the tangy mayo sauce and delicate bonito flakes was a tasty departure from the more formal and traditional Korean cuisine I have had the opportunity to enjoy on previous visits. I know that many argue they aren't adventerous enough to dive deep into street food culture but I for one have found it to be one of the most important aspects of being fully present in the moment and enjoying the flavors many locals experience daily. For 3000 KRW or about $2.60 USD you would be hard pressed to find another opportunity to fully take in Seoul and South Korean cuisine. The boom of food trucks across major US cities has given birth to what many in other parts of the world have know for some time. Small, delicious, local foods prepared with love and passion make for a potent combination for your tastebuds. As one of my photos clearly depicts, if it looks good enough for a Korean grandmother, then whom am I to argue with that. It was important that we rounded out our day long visit by stopping for a cup of traditional Korea tea. In my previous visits to Seoul, I have made an effort to take time and visit one of the many small and independent tea shops in the nearby area of Insadong. Prior to my visit to South Korea, I was in San Francisco for a few days and across from my hotel was one of four Starbucks shops in a three block radius. What stands in stark contrast to the beats pumping, "in and out" experience of coffee shops in the United States, is a total experience of space and tea joining forces to give all the senses fully enjoyable and memorable experience. Without question, the best way to cap off a day in Bukchon was to explore the possibility of finding a new tea shop in the neighborhood we were in and I decided that as we strolled the main street, Director of Music, Jennifer Elowitch and I would meander into some of the small shops and stores located in the area. What drew our attention was a tea shop whose store front was a collection of flowering plants. 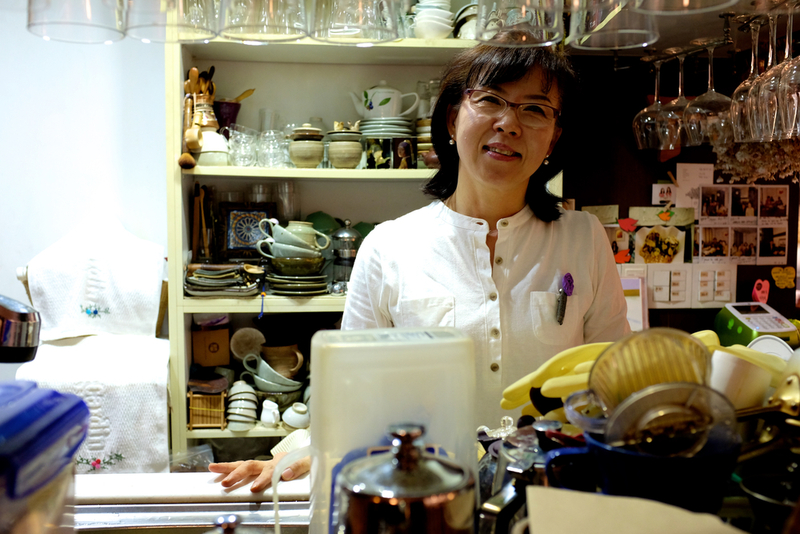 Once inside, the shop's owner, an elegant and soft spoken woman asked us to find a spot and brought us a menu. Traditional Korean tea shops are a superb way of caping off a long day strolling around the neighborhood and I would agree with many who feel that this nothing more enjoyable or as rejuvenating as sipping a cup of Korean tea in a traditional Korean teahouse, or chatjip. "These simple and enchanting places are a splendid medley of tastes, aromas and sounds, brought together in a warm and quintessentially Korean setting." Bringing a friend with you makes for the ideal mix of intimate conversation over tea and Korean snacks, and our experience in Bukchon delivered in every single way. 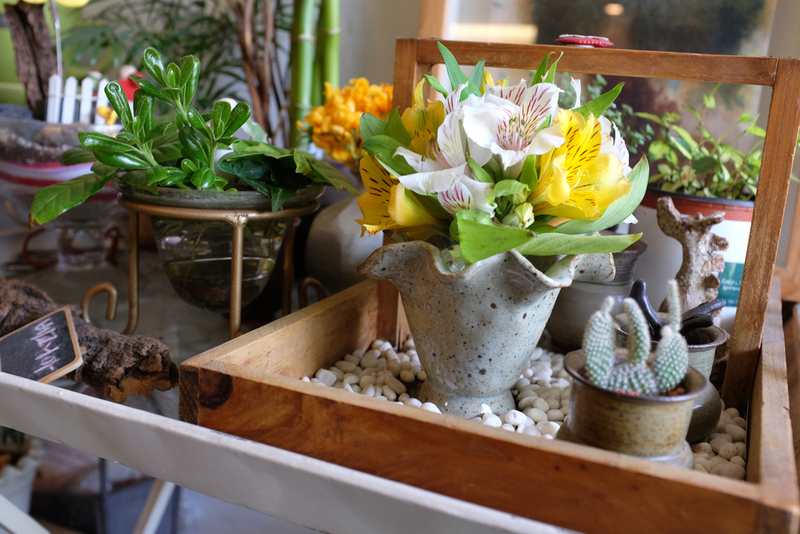 The zen like space in this tea shop was filled with hand thrown Korean pottery, small plants and hand painted rocks. 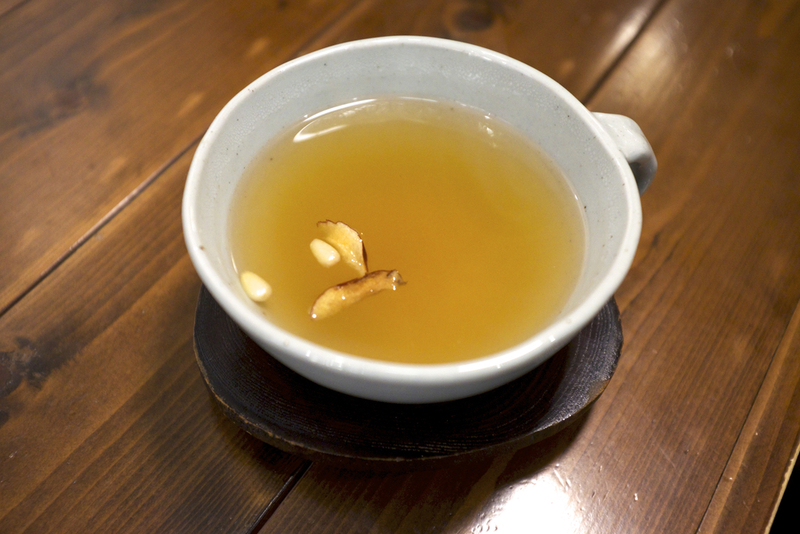 The ginger tea we enjoyed was brewed fresh and served with a small, wooden plate filled with nuts. In the background, classical music filled the atmosphere and our fellow patrons made the most of the quiet respite created by sight, smell and sound. Spending a short time here was a welcomed addition to our day. As I look back, I can see now that devoting ample time to fully embrace the entirety of a specific place proved far more enlightening than rushing from location to location seeking the perfect photograph. The relationship between experiencing Bukchon Village and photographing it resulted in a wonderful balance for me as a traveler and photographer. All my photos were shot on a Fuji X100T and a roll of B&W TriX 400 Film was shot on my Leica M6. I am really looking forward to seeing how the film photos turn out when I get home and find time to process the film. As I begin to pack my suitcase and prepare for a quick flight to Beijing, I am humbled by the opportunity to have soaked in this wonderful Korean gem. Many have ranked Bukchon as one of the top five places to visit when in Seoul. I whole heartedly agree. What I would say to anyone traveling throughout Asia is consider doing less in a day in an effort to take in more. While there are many exotic and wonderfully historic places to visit in Asian cities like Seoul, the depth and breadth of experience that comes from fully immersing yourself in one place leaves a lasting impression. I remain grateful to have made so many connections with parents, students and alumni from Walnut Hill and my increasing comfort with "being" in Seoul has made it one of my favorite destinations in the world. The balance of culture and Korean hospitality leave an indelible mark on anyone fortunate enough to make the journey and truly get to know the place and its people.